Facebook users spent less time on the site even before it announced major changes to its News Feed in January. Measures such as showing fewer viral videos cut time spent on the social network by about 5%, or roughly 50 million hours a day, in the last three months of 2017. However, Facebook reported better than expected results despite the fall. Chief executive Mark Zuckerberg said the priority was encouraging more personal interaction among users. "Helping people connect is more important than maximising the time they spend on Facebook," he said. "We can make sure the service is good for people's well-being and for society overall." In January, Facebook said it would make changes to news feeds to prioritise posts from friends and family and make content from businesses and news outlets less prominent. The number of monthly active users rose 14% to 2.13 billion in the three months to December, although that was slightly lower growth than the previous quarter. In the US and Canada, which generates a sizeable proportion of Facebook's advertising revenues - the number of daily users fell about 700,000 to 184 million in the quarter. 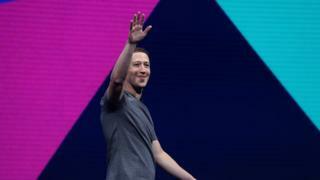 Facebook said annual revenues soared 47% last year to more than $40bn (£28.2bn), while profits jumped 56% to nearly $16bn. The gains came despite a $2.3bn payment triggered by recent changes to US tax law. There are politicians, academics and even former executives lining up to tell Facebook what's wrong with it, but Mark Zuckerberg has only ever trusted his own data. And so these tweaks to the News Feed, above all else, are a result of what Facebook's engineers have seen for themselves. Mr Zuckerberg's (pretty convincing) argument is that by not fixing the News Feed, the long-term health of the company could be in jeopardy - not because of Russian propaganda or fake news, but because it just won't be fun or useful to use. The 33-year-old is again warning investors that it's going to take time to heal the News Feed, making it a better place for you and for me - and then eventually, he hopes, advertisers and businesses. What we need to look out for is investors' patience with him. Over the past two years Facebook has consistently beat expectations, and it did again today, even with the caveats. Will Wall Street cut him some slack as a result? Daniel Ives, an analyst at GBH Insights, said the firm's financial results were "robust" and described Facebook's strategy as "the right medicine at the right time". "We believe this strategy will drive higher advertising pricing monetisation trends in the long-term for Facebook and was a move Zuckerberg & Co needed to make," he said. Facebook shares initially fell by more than 4% in after-hours trading, but rebounded quickly following the results call.